Was it a meaningful movement, or just noise? 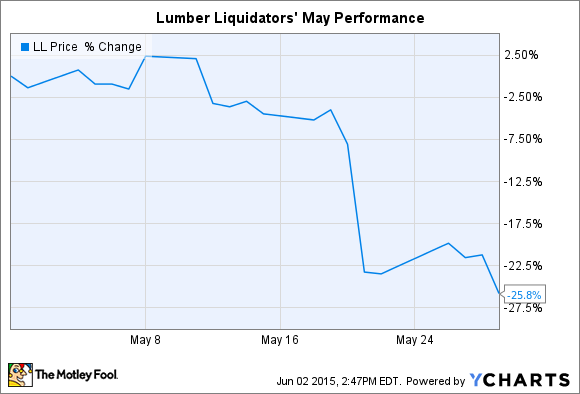 What: Hardwood flooring retailer Lumber Liquidators' (NYSE:LL) stock sank by 26% in May, according to S&P Capital IQ data. Shares are now down 72% in the last year and remain close to the multiyear low of $20 set on June 1. So what: Already on edge over the company's sinking growth prospects in the wake of a controversy over the safety of its Chinese-sourced laminate flooring products, investors were shocked to learn on May 21 that Lumber Liquidators CEO Robert Lynch had resigned. Founder Tom Sullivan will take the job on an acting basis until the company can find a permanent replacement. The news apparently took the company by surprise as well: In a press release, the retailer called Lynch's resignation an "unexpected" departure. While the resignation might not be related to the current regulatory reviews over formaldehyde levels in Lumber Liquidators' laminate floors, many investors have opted to take the more pessimistic view -- that there is more bad news to come. Now what: Lumber Liquidators' latest business update included a warning that the company could not provide a full-year sales estimate because demand is being significantly affected by negative publicity regarding its product quality. Comparable-store sales slumped by 18% in March, but improved slightly to an 8% drop in April. Sure, that might mark the beginning of a sales growth turnaround. But the stock still faces significant uncertainty. Investors are waiting to find out what the new leadership team will be, along with results from the ongoing regulatory investigations by the U.S. Department of Justice and the U.S. Consumer Product Safety Commission.